Some of you have asked me to elaborate on the grant application I have been writing – so I am! 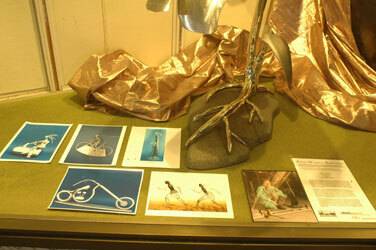 We have been having AWE – Artists Window Exhibits – in our town lately. We have had shows in July, August and again in mid-Sept – mid-Oct (yes, now). I have put in a grant application requesting some money to coordinate this project in 2008. It is in the mail!!! Some of us visual artists started meeting over a year ago to connect, build the local economy, and in general figure out how to further our careers as artists. We have a fantastic area full of artists … we are rural and there is a economy rich in agriculture and not money. That is, we are one of the lowest income areas of the whole state (Massachusetts, US). So we need to build the creative economy here. When tourists come here, they can’t believe how inexpensive the art is. But many local people say the prices are way too high. So we are working to get this area to be a tourism destination to hook up art lovers and artists. By we, I mean much more than our small group of artists. It is a big initiative that is getting support from our whole county. I think we are the size of Rhode Island but with only 70,000 people. And 69,000 are artists – no, that part is a joke. But we do have thousands of artists here. I have been coordinating this group, chairing, taking minutes, writing them up and sending them out (by email), being the point person and generally coordinating whatever we were doing. I have put tons of energy into having the AWE projects go smoothly. The local business organization (Greenfield Business Association) has set up 2 Progressive Dinners where people have gone from restaurant to restaurant for each of 6 or 7 courses. Our artists group, Artists of Franklin County, has provided beauty and enjoyment through our work in shop windows. And I am sure you can imagine that there is a lot of work involved in coordinating all this! Which is why I would like to get some financial compensation for a little bit of the time and materials. You asked what it would mean … that I would be able to more easily be able to take the time to up the quality and attend to the details of this project. What are you up to? Diane this is the way to go for artist that live in areas that are not so highly populated to sell their work and yet do have the opportunity to cash in on tourism. A network of artist I am involved with learnt about small business in relation to tourism and how we could market our art to visitors in our area. We as artist are now earning the respect of locals (Flinders Ranges/South Australia) that once thought our art wasn’t all that important to the economy. We are now bringing more people to the area because of our art and like you are told that our art is under priced. I hope you get the grant. It is with these grassroots movements and local involvement that your community and society at large will benefit. I admire you for taking that step and making the arts a vital part of your community’s identity. It is very good that you have a group working together (not really a given these days) and they are more than lucky to have you!!! This is the way to go. Bravo!! Cheers for our own Diane!!! Yay!! Hi Susan, thanks for the confirmation of the way to go for rural areas! This is good to hear. We used to be manufacturing and have changed over to service and some people get that the creative economy will help a lot .. but there are other parts of the area who think Walmart is what will save the economy. Great to hear about your success! HI Neda, thank you for your good wishes!! You are so sweet to me. Sometimes groups are hard to get together and hold together so I sure hope this grassroots initiative is effective! I am a big grassroots fan in general. Thank you!! I wish you lived here! Thank you for expounding on your grant! I think this is a very worthy project and that you will be rewarded in the long run for all that you do to further it’s progress. I applaud you for being involved in this project and making your community the kind of place you wish it to be. Hi Bobbie, thank you for your encouragement! It would be great to get rewarded … and yet so many of us contribute to our communities every day and I think it is also part of being a person. But it IS nice to be recognized. thank you! Wow, what a wonderful project and what a great job you are doing. I never cease to be amazed at what people are able to do when they follow their hearts and their passions. I hope it all works out well. I know grant applications are hard to write up and much work goes into them. I hope you are successful and I hope lots of tourists discover you and all the other artists and your county. I am sure you’ll link to my diary..
Hi Irene, thank you for your support! Thank you! I’m not a commenter to blogs in general, but your article on Grant Application Revisted really caught my eye. I had been looking for information on Business Applications on Ask.com, and was intrigued by the link to here. Good job! Hello webmaster…I Googled for grant writing, but found your page about Grant Application Revisted…and have to say thanks. nice read. I am glad to be one of many visitants on this great website (:, thankyou for posting .